I can't believe it's March already! It doesn't seem like two minutes ago I was tucking into my Turkey on Christmas Day. March is definitely one of my favourite times of the year - Spring is here, the promise of warmer weather is in reach, the days are getting longer and there's a lot to celebrate including Mother's Day. Steve is working this Mother's Day (boo) so it will just be me and the kids. They have promised breakfast in bed and a few treats so I can't wait to see what they have in store. I am teaming up with Sweetie Home today and sharing a few of my top picks from their website this Mother's Day. Plus I have a fantastic Emma Bridgewater Giveaway at the end of this post - I don't know any mum who wouldn't appreciate this as a gift! Sweetie Home are based in Northumberland but can post across the UK and Worldwide. As you know, supporting local and small businesses is really important to me and I would highly recommend checking Sweetie Home out. Delivery is just £3.50 across the Uk and they stock a fantastic range of beautiful gifts. My choices are just a snapshot of what's available. Sweetie Home also specialise in Baby & Children's gifts so please keep them in mind for future Birthdays, Christenings and Baby Showers. We are delighted that Sweetie Home have provided us with an Emma Bridgewater Caddie Set to giveaway to one lucky reader. What a fantastic prize! I think most mum's would be delighted with an Emma Bridgewater gift this Mother's Day. You can enter via the Rafflecopter giveaway at the bottom of this post - daily entry is available via Twitter. Good luck! 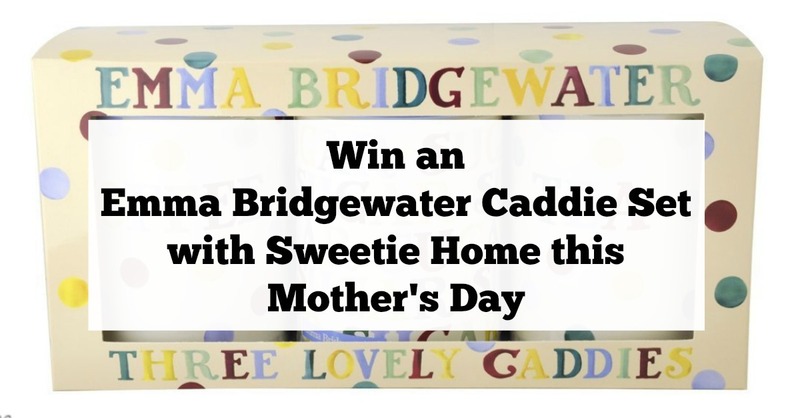 Terms and Conditions: Prize is 1 x xEmma Bridgewater Caddie Set (as pictured) worth £20 and promoted by Sweetie Home. Item will be posted to any UK (mainland) address provided within 28 days of the giveaway closing. UK Mainland Postage is included. No refunds will be given. There is no cash alternative. Giveaway ends midnight 12/3/17. A winner will be selected at random from all valid entries and notified via email. I am a HUGE Emma Bridgewater fan so would choose the Polka Dot large tray! I love Emma Bridgewater and I'd love the hen tray. I would get my great aunt the Rose & Bee set of 3 round cake tins....She does love to bake. http://www.sweetiehome.co.uk/product/fleece-babynomade-in-red-size-6-12-months/ - Love this as it looks really snug. The BLUE HEN Set of 3 Square Cake Tins are gorgeous! I'd choose the Blue Hen biscuit barrel for my mum. She loves biscuits and it's so cute!! The bunny lidded egg cup for my friend's daughter. Bunny Lidded Egg Cup. They are so adorable and the special lady does like a breakfast egg. I'd definitely choose the Emma Bridgewater BLUE HEN BISCUIT BARREL , it's absolutely enchanting and my mum would love it! The CAROLINE ZOOB LARGE MUG ROBIN, my mum loves Robins. Got to be the Black toast large tray. I have loads of emma bridgewater stuff and been to the factory 4 times!!! I love the blue hen biscuit barrel. Will buy the ROSE & BEE BISCUIT BARREL for my mother in law. http://www.sweetiehome.co.uk/product/caroline-zoob-12cm-round-dish-rose-tattoo/ I'd choose this plate. BLACK TOAST BISCUIT BARREL would be awesome!! I would choose the large mug robin. I love the Blue Hen design, especially the set of 3 square cake tins. I would choose the Caroline Zoob Large Jug Rose Tattoo. It would make a lovely gift. Emma Bridgewater Polka Dot Biscuit Barrel. i would buy the PAIR OF BEADED GLASS CAKE STANDS for my mother in law. Some lovely things there, I would choose the POLKA DOT LARGE TRAY, for my mums birthday. The rose and bee cake tins for my amazing mum. THE BLUE HEN CAKE TINS ARE LOVELY! MY MUM WOULD LOVE THEM. rose and bee cake tins for all her baking! I really like the blue hen design, the biscuit barrel is lovely. Butter dish would be great! Emma Bridgewater polka dot biscuit barrel would look perfect in our kitchen. What a fab range. I would go for the BLUE HEN Set of 3 Caddies. CROSSWORD DOG’ TEA TOWEL would be ideal for my Mum. :) Always had a dog and she said "no more" when we lost Roxy, but Doni needed a new home 6 months later and he's been here just over a year now. I would choose the polka dot tray. I would get the CAROLINE ZOOB LARGE MUG ROSE TATTOO for my mum, she loves her tea and has a wide selection of pretty mugs. The polka dot set of three caddies!